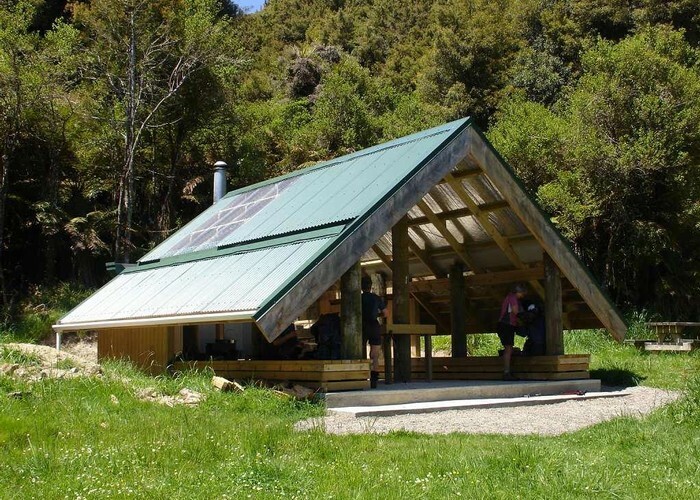 This is another option in the Whirinaki, taking in Mangamate Hut. Follow the track to Central Whirinaki Hut, past Vern's Camp until you you get to the Kakanui Stream. This is easily identified because there is a sign post. The stream provides relatively easy travel, either in the stream bed or beside it, which ever you find easiest. Watch out for the dreaded stinging nettle or Ongaonga. If you don't know how to identify it, you will soon know when you put your hand in it. There a two little slot gorges that make the trip a little more interesting but these can both be bipassed on the true right if you wish. There are a few more windfalls at the top of the stream making going a little harder so you will be glad to see orange markers after about 3 hours from the Wirinaki Track. Follow the markers away from the stream and climb steadily on a good track, arriving at the hut in about 20 mins from the stream. From the hut, follow the track and then the Mangamate Stream down to the bridge where the Whirinaki Track crosses the stream. It is about 3-4 hours from the hut to the carpark again. Added 18 January 2011 by pmckepmcke. 2 revisions, most recently 19 January 2011 by pmckepmcke.